We’d love your help. 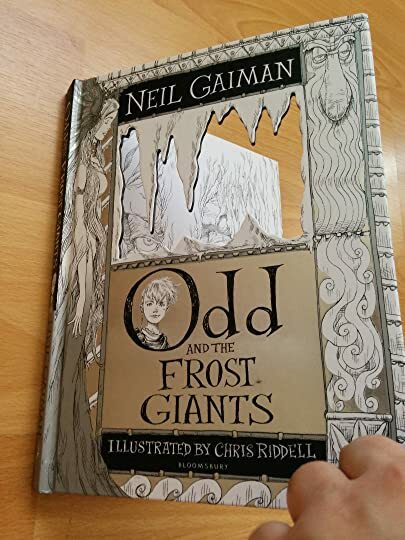 Let us know what’s wrong with this preview of Odd and the Frost Giants by Neil Gaiman. To ask other readers questions about Odd and the Frost Giants, please sign up. Is anyone going to fix the publication year being marked as 1014? Jim Sanderson Wasn't that the original publication date? Notes: It's a delightful read with a simple, yet original story. It knows exactly what it's supposed to be and does it very well. Kenny I loved it. It’s a fun read. Jayson Kenny wrote: "I loved it. It’s a fun read." This book is a little treat. If you enjoyed Norse Mythology then you will likely adore this. This is a children’s tale, though as with all good children’s books it’s perfect for adults too. Odd is a tough little boy. He is physically disabled and shunned by his step-father who pushes him out of his family home, though he refuses to give up. He refuses to stop smiling and it is because of this that he succeeds. Positivity can go a long way and it certainly helps when you stumble across the Gods. I This book is a little treat. If you enjoyed Norse Mythology then you will likely adore this. This is a children’s tale, though as with all good children’s books it’s perfect for adults too. Imagine this: Thor (who has been transformed into a bear) has his paw stuck in a tree after trying to reach a bee’s nest. Odin (who has been transformed into an eagle) flies overhead watching the scene. Loki (who has been transformed into a fox) skulks in the corner bemused. Odd walks in unawares and offers his help. The three Gods have been banished from Asgard and their kingdom is now in the hands of the Frost Giants. Unsurprisingly, it’s all Loki’s fault. Sound familiar? Gaiman has captured the essence of Odin, Thor and Loki terrifically. The marvel cinematic universe and the comic book writers do a good job with their personalities, though their actual physical attributes are completely wrong. It’s all in the minor details. Some of it may sound unimportant (the fact that Thor is supposed to have a big red beard for example) though things like this are quite important when dealing with Gods. So I like the attention to detail here. 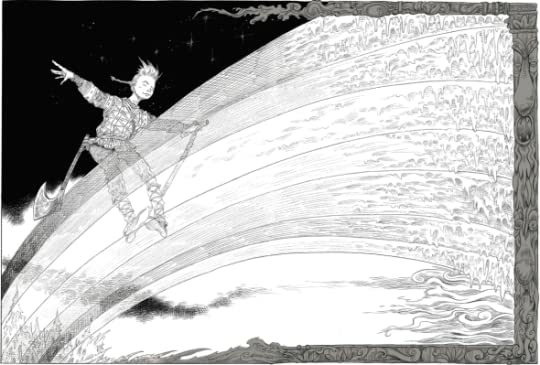 "Odd and the Frost Giants" is a short, simple, magical and disarmingly beautiful tale that draws from Viking and Norse mythology. This is basically a children's book that features a much nicer version of beloved mythological characters! The tale introduces Odd, who is odd. Yes, it is odd. *Gaaaah, this is so confusing. * Odd is the name of a Viking child. He is brave little lad but luck has never been his friend. He ran away from his home because of his cruel stepfather. While Odd was on the run, he came across the Gods of Asgard who have gotten themselves into a bit of trouble.... And Odd volunteers to help them! 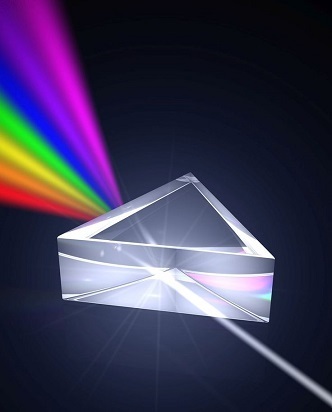 The rainbow moment. Newton would be so proud. Go science! The BFG moment. Odd using psychotherapy on frost giant! Neil Gaiman can do no wrong! What a wonderful way to follow up Gaiman's Norse Mythology. 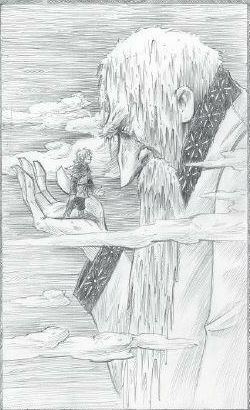 Odd and the Frost Giants is a story about Odd, a young boy, and his meeting with Loki, Thor, and Odin. Er, though not in their normal form, in animal form (a fox, a bear, and an eagle). Odd is on his way with the trio to Asgard to save it from the Frost Giants. Who, thanks to Loki naturally, put them into animal form and has taken over Asgard. What a great story. Wonderful to read this one to young children. The story is short and the bo What a wonderful way to follow up Gaiman's Norse Mythology. Odd and the Frost Giants is a story about Odd, a young boy, and his meeting with Loki, Thor, and Odin. 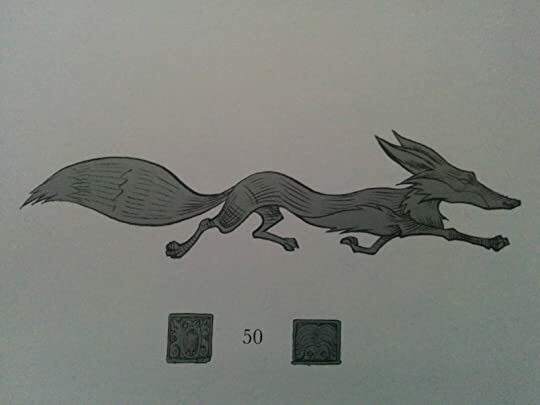 Er, though not in their normal form, in animal form (a fox, a bear, and an eagle). Odd is on his way with the trio to Asgard to save it from the Frost Giants. Who, thanks to Loki naturally, put them into animal form and has taken over Asgard. Each time I read something by Gaiman, I think, “This. This is where he excels.” Whether it's a fairy story (Stardust,) or a children's story (Coraline.) Or the melding of American Mythology with a new Mythology of his creation (American Gods, Anansi Boys.) Maybe it's something vaguely steampunkish and other-worldly, like Neverwhere. Sometimes it's when I revist the complexities in Sandman. Or maybe I'm not actually that fickle, and I just like the way his phrasing and ideas are like mainlining s Each time I read something by Gaiman, I think, “This. This is where he excels.” Whether it's a fairy story (Stardust,) or a children's story (Coraline.) Or the melding of American Mythology with a new Mythology of his creation (American Gods, Anansi Boys.) Maybe it's something vaguely steampunkish and other-worldly, like Neverwhere. Sometimes it's when I revist the complexities in Sandman. Or maybe I'm not actually that fickle, and I just like the way his phrasing and ideas are like mainlining story straight into my amygdalae, so most of the time it doesn't really matter what type of fiction he's writing this time. I like best to listen to his novels in audio format; it makes me feel like I'm wrapped in a big quilt and being read to like a child. Odd is another installment in his latest string of children's tales. This one borrows heavily from Norse mythology, but mostly through allusion to other, more established stories. I had to go look some of them up – like how Odin sacrificed an eye to gain knowledge and wisdom from Mímir's Well, and about Jötunheimr, the Land of Giants. I love that there's a deeper layer of complexity to the story – but only if the reader desires it. In this completely Gaiman-invented tale, Odd, a young woodcutter's son, runs away from a cruel stepfather, and ends up meeting Odin, Thor and Loki, who have been outsmarted by a giant. I both read and listened to this tale, it's quite short. The audio file was well under 2 hours in length. I probably could have read it alone in far less than an hour. This edition has wonderful little pencil drawing illustrations by Brett Helquist, which underscore its suitability for children. And it is just wonderful for kids, without any focus on the darker themes present in Coraline, or even The Graveyard Book. I think it would make a fabulous springboard for homestudy elementary school children, as an introduction to mythology. This one really is for all ages. This tale follows Odd, a young Viking boy, left fatherless following a raid and in his icy, ancient world where there is no mercy for an unlucky soul with a crushed foot and no one to protect him. Fleeing to the woods, Odd stumbles upon and releases a trapped bear. And then Odd's destiny begins to change. The eagle, bear and fox Odd encounters are Norse gods, trapped in animal form by the evil frost giants who have conquered Asgard, the city of the gods. Now our hero must reclaim Thor's hammer, outwit the frost giants and release the gods. One of the main reasons I picked this book up was because I wanted to get through a book really quickly and thanks to the gorgeous illustrations, this book flew by. Of course, the Goddess Freya saves the day. She was my favorite. Though it was a quick read, it didn't really impact me that much. I was glad to have something to add to my reading challenge... but other than that, it wasn't that memorable and I'll probably forget about it by the very next day. I don't care what anyone says about Gaiman. The man can write a classy tale no matter where or what he's writing about. This is, after all, only a retelling of an old story, but it's a very particular and beau What a delightful counterpoint to Norse Mythology! 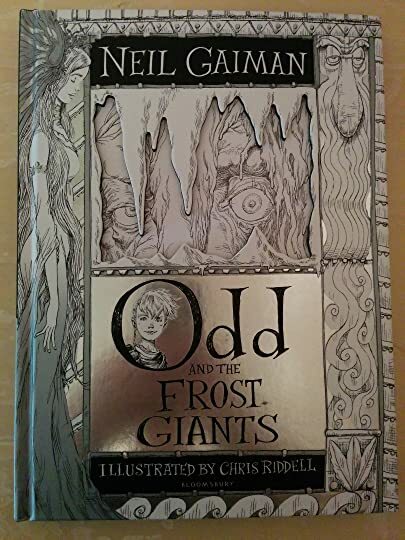 Odd and the Frost Giants is a short novel by Neil Gaiman probably intended for a young adult audience, or younger, or older; it is a fun, fable-like story. Odd is a young Viking boy who has an adventure amongst a setting in Norse mythology. A fan of American Gods will recognize Gaiman’s voice and a fan of DreamWorks film How to Train Your Dragon would also like this short work. Charlotte May Meghan wrote: "My favorite author!" As mentioned a few days ago already, this is the special edition of a story Neil Gaiman wrote and published for World Book Day in the UK in 2008. The book is about the titular viking boy Odd (meaning "the tip of a blade" and not "strange"), who had a terrible accident after his father died in an equally terrible accident (they are not the most lucky of people), leaving Odd with a disability. He is shunted in the village for being weak until one day he leaves to go back to his father's old hut in As mentioned a few days ago already, this is the special edition of a story Neil Gaiman wrote and published for World Book Day in the UK in 2008. The book is about the titular viking boy Odd (meaning "the tip of a blade" and not "strange"), who had a terrible accident after his father died in an equally terrible accident (they are not the most lucky of people), leaving Odd with a disability. He is shunted in the village for being weak until one day he leaves to go back to his father's old hut in the woods. There, he meats a fox, a bear and an eagle, some frost giants and gods of Asgard, travels over a rainbow bridge and proves that physical strength isn't everything. I won't say more about the tale because that would spoil it. Some might call this a simple tale, but it also a very old one. Or, at least, a variation of a very old and prominent Norse tale. The way Gaiman tells it with his dry humour and charming descriptions, this viking world comes to life, making this the perfect story for a delightful winter afternoon (and not just for children either). It might also be worth mentioning that Neil Gaiman manages to get all the mythological details absolutely right, therefore teaching the reader a thing or two about Norse mythology in general. 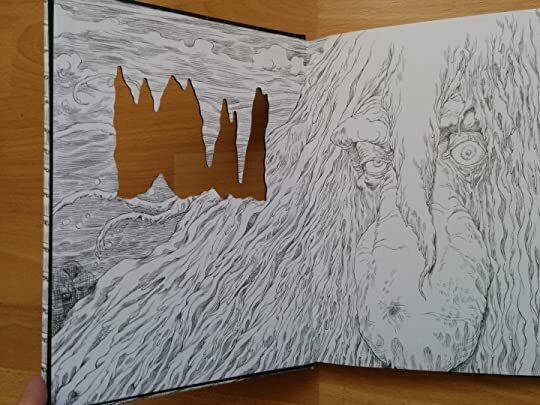 However, what makes this book truly special is the combination of Gaiman's magical word-weaving with Chris Riddell's equally magical illustrations. The silver details are simply stunning and very appropriate for the wintery theme. 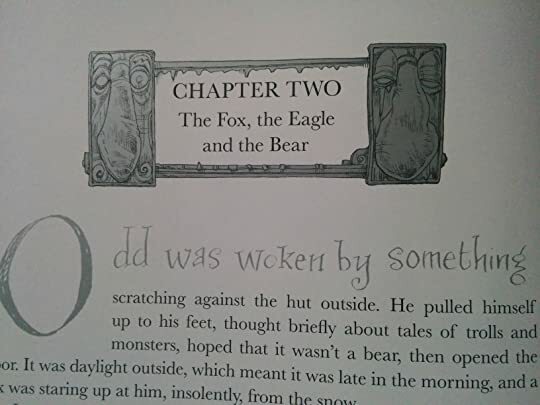 I have included a picture of how the chapters begin and one of my favourite ornament at the bottom of a page (they are all different) but unfortunately the camera cannot adequately show the silver glint, you'll simply have to believe me. 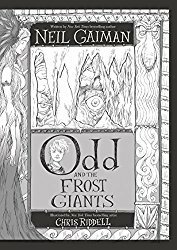 Odd and the Frost Giants is such a short and easy read, you'll gulp it down in an instant and be shouting to Neil Gaiman, "Next!" This is the most childish Gaiman story I've read yet and that's saying something. But it's not saying something as negative as some might take it. Odd... is intended for the kiddies. It's not a terrible introduction for youngsters into the realm of Norse mythology. 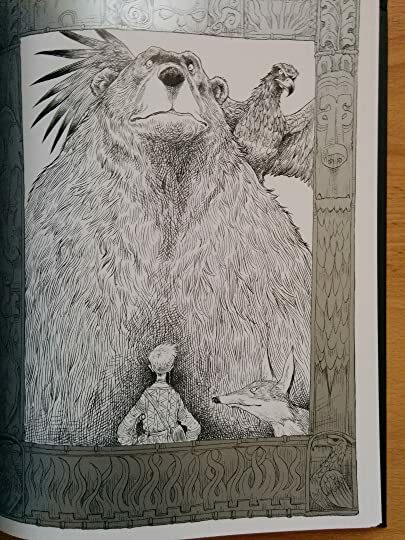 In it, a crippled boy meets a few anthropomorphic animals who turn out to be outcast gods, who need this Odd and the Frost Giants is such a short and easy read, you'll gulp it down in an instant and be shouting to Neil Gaiman, "Next!" It's not a terrible introduction for youngsters into the realm of Norse mythology. In it, a crippled boy meets a few anthropomorphic animals who turn out to be outcast gods, who need this mortal's help in tricking their frost giant enemies so they can get back into Asgard. Gaiman falls back on very familiar territory for this one, tapping Odin, Thor and his hammer, and the crafty conniver Loki in his usual role of mischief-maker. There is very little new or inventive stuff going on here in this mini adventure. It reads like a tv producer who's taken a classic episode of a popular show, rearranged the scenes a little, and presented it for your viewing pleasure. Wow, Neil Gaiman! Odd and the Frost Giants is a delightful, enjoyable and heartwarming read... A wild and magical trip to the land of Gods and Giants! He was odd, though. At least, the other villagers thought so. But if there was one thing that he wasn`t, it was lucky. Odd is indeed a very special kind of twelve-year-old boy. Some Wow, Neil Gaiman! Odd and the Frost Giants is a delightful, enjoyable and heartwarming read... A wild and magical trip to the land of Gods and Giants! Odd is indeed a very special kind of twelve-year-old boy. Someone who in spite of all the very bad luck and unfortunate events, remained cheerful, smiling and optimistic. Este breve libro es ideal para introducir de una manera muy amena a los más pequeños a la mitología nórdica, al menos para despertar su interés en el tema. No he leído tanto de Neil Gaiman como me gustaría, sin embargo me alegro de haber podido acceder a este título (gracias a mi pareja, que me lo prestó) ya que me pareció una historia sumamente fresca y tierna, y no pierde la magia que destaca a Gaiman en ningún momento. Odd is a young Norseman, who lost his father after a Viking raid. He is partly disabled after a tree fell on his leg. His mother has now re-married and his new step-father cares little for him preferring his own children. This year the winter is dragging on and on, and having now had enough of home, heads out to a hut his father owned in the forest. In the forest he comes across a bear with his paw stuck; he frees it. 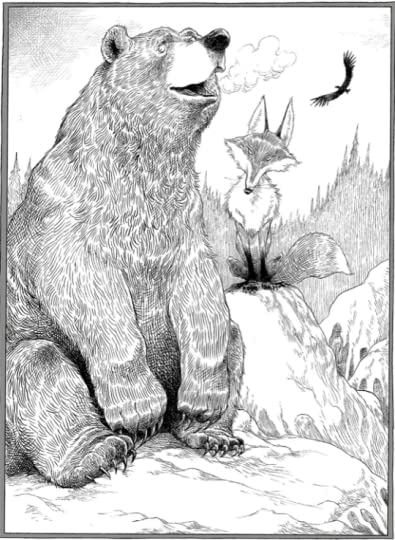 The bear is grateful, and Odd learns that the bear and his companions, a fox an Odd is a young Norseman, who lost his father after a Viking raid. He is partly disabled after a tree fell on his leg. His mother has now re-married and his new step-father cares little for him preferring his own children. This year the winter is dragging on and on, and having now had enough of home, heads out to a hut his father owned in the forest. In the forest he comes across a bear with his paw stuck; he frees it. The bear is grateful, and Odd learns that the bear and his companions, a fox and an eagle, are actually the gods Loki, Odin and Thor. They have been tricked by a Frost Giant and cast out of Asgard. It is this Frost Giant that is stopping spring returning by holding the land in a perpetual winter. Odd travel with the gods back to Asgard. They stay overnight at Mimir Well, where in the pool Odd sees his parents in their youth and receives advice on the task ahead. Odd then travels on ahead to confront the Frost Giant with the hope of returning equilibrium to the land. My third Gaiman, a fairy tale for kids but also for the older people, like me :-) As a kid, I used to love all fairytales.... I enjoyed this short novel, 'inspired by traditional Norse mythology'. 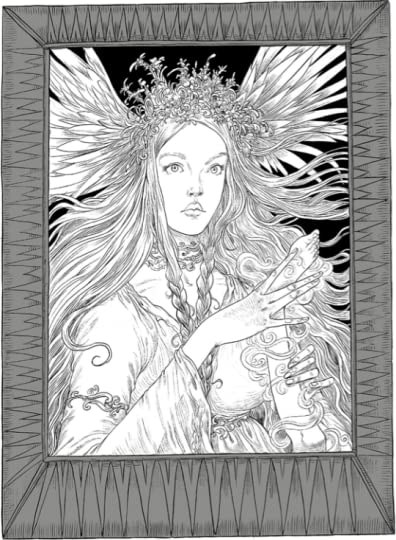 The pencil drawings in the book also beautiful. 3.5 going on 4. Entertaining short read! There was a boy called Odd, and there was nothing strange or unusual about that, not in that time or place. Odd meant 'the tip of a My third Gaiman, a fairy tale for kids but also for the older people, like me :-) As a kid, I used to love all fairytales.... I enjoyed this short novel, 'inspired by traditional Norse mythology'. The pencil drawings in the book also beautiful. 3.5 going on 4. Entertaining short read! A wonderful book to start off a year with. Neil Gaiman truly is one of best authors ever. Odd and the Frost Giants was a quick, but very rewarding book to listen to on audio. The author himself narrated, and his voice is very pleasant to listen to. He knows his characters best and animated them as richly as he had intended them. 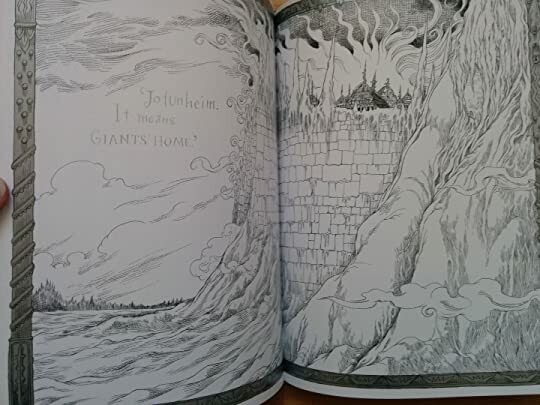 The Norse mythology elements were interesting, and I loved how Mr. Gaiman injects a humorous view of the constant strife between the Aesir and the Frost Giants. He embodies the traits of Odin, Thor, and Loki very well, and their animal forms fit what characte Odd and the Frost Giants was a quick, but very rewarding book to listen to on audio. The author himself narrated, and his voice is very pleasant to listen to. He knows his characters best and animated them as richly as he had intended them. 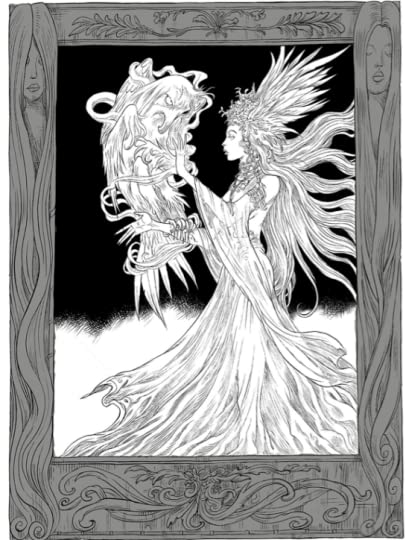 The Norse mythology elements were interesting, and I loved how Mr. Gaiman injects a humorous view of the constant strife between the Aesir and the Frost Giants. 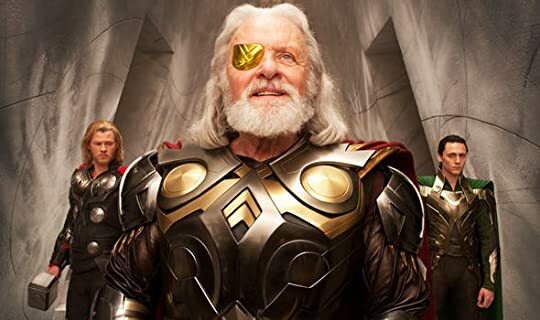 He embodies the traits of Odin, Thor, and Loki very well, and their animal forms fit what characteristics one would attribute to the three Norse gods. In this story, the frost giants are almost portrayed, but not quite, as the underdogs, caught in a losing war with the Aesir. It cracked me up how afraid of Lady Freya's complaining the lead frost giants were. I absolutely adored Odd, with his oh-so annoying smile that he put on his face exactly when he wanted to disarm or frustrate someone else. He was a really good guy. I liked that he was able to figure out a way out of most of the scrapes he found himself in, and met obstacles in a calm, thoughtful manner. I wanted everything to work out for this kid, because he deserved it. I don't have much more to say since this is a pretty short little book. The only thing I could add is that I enjoyed it immensely! I will admit that this is the second time I have read this book although the version I first read was the world book day paperback (no idea why why Goodreads insists I have read the hardback version). Either way this is a much better presented version of the Norse tale than previous versions - with of course the addition of atmospheric illustrations. I think for me one of the appeals of Neil Gaiman is his ability to weave tales in style that I can easily get in to - reading only a few pages I fee I will admit that this is the second time I have read this book although the version I first read was the world book day paperback (no idea why why Goodreads insists I have read the hardback version). I think for me one of the appeals of Neil Gaiman is his ability to weave tales in style that I can easily get in to - reading only a few pages I feel connected to the story and ready to face what adventures and adversities my befall our hero (or heroine). But I think what really shows his power as a story teller is the fact that he can convey quite stark and unsettling ideas without sanitising them or making like of them. For me this book is one of those stories you can read again and again and still enjoy it even though it is less that 130 pages long you still feel as though you have been on some epic journey and considering the Norse connection that is as it should be. Listened to this story on audiobook via my library's BorrowBox service! Odd was a far better story than The Sleeper and the Spindle. Who would have thought that Norse legends/mythology could be so interesting? In the audio edition, Neil narrates it himself as we follow young Odd who lost his father due to a raid conducted by vikings. 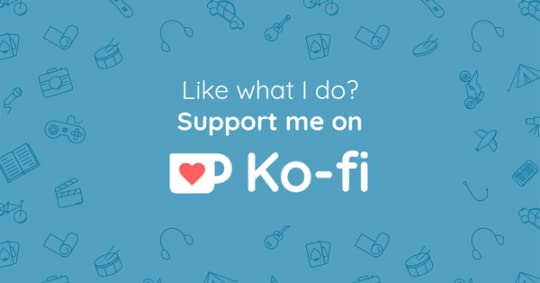 In this year, the winter doesn't seem to stop and with struggles in his home with mother, step-father and step-siblings, Odd ventures out towards a hut that was belo Listened to this story on audiobook via my library's BorrowBox service! Il mio primo Neil Gaiman. Avevo già sentito parlare della capacità descrittiva dell'autore e non posso che confermare; sembra davvero che ,durante la lettura, ti si materializzino davanti il mondo è i personaggi descritti nelle sue pagine. Per quanto riguarda la storia l'ho trovata davvero dolce e di piacevole lettura, amando già molto la mitologia norrena. Bellissima caratterizzazione dei personaggi e degli animali a loro correlati. Avanti con il prossimo Gaiman! A beautifully written story inspired by Norse mythology and aimed at children that is bound to bring smile to your face. Gaiman, as always, delivers! Отново невероятна история от Нийл Геймън, съпътствана от също толкова забележителни илюстрации, дело на Крис Ридъл. С “Од и ледените великани“ Геймън успя да ми поднесе обилна доза приключения, малко смях, остроумни диалози и куп чудати герои, вдъхновени от митологията. Следващата „Геймън“ спирка обмислям да е „Скандинавска митология“. А някой от вас да я е чел? This a wonderful short coming of age tale, dressed in the fine fantasy based on Norse mythology. I thoroughly enjoyed it! Odd, although his name doesn't mean that where he lives, is still actually pretty odd. Nobody gets him. It gets worse when his father dies and he greatly injures his leg. Things get so tough, Odd decides to leave and never come back. But as he does, something happens... Odd meets some gods in trouble. Namely, Odin, Thor and Loki. And he sort of ends up helping them out. It's a This a wonderful short coming of age tale, dressed in the fine fantasy based on Norse mythology. I thoroughly enjoyed it! 3.5 stars. Read this to my child, who really enjoyed it. Z pohledu dětského čtenáře bez pochyby plný počet hvězdiček a mohu říct, že jsem se u čtení také nenudila. Knížka má doporučení od devíti let, ale naše děti jsou menší a stejně si to užívaly. Možná nepobraly úplně všechno, ale počítám, že k téhle knize se bude opakovaně vracet. Kontext: V návaznosti na tuhle knížku jsme zkoušeli i Severská mytologie, ale to pro děti ještě opravdu není - je to příliš zkratkovité a pro děti nezáživné. Tak si to necháme, až ve škole dojdou k severské mytologii. První věta: "Byl jednou jeden chlapec, kterému říkali Podivný Odd, a v těch časech a končinách na tom nebylo nic zvláštního ani neobvyklého." A fast and fun tale giving a twist to Norse lore. Narrated by the author, Neil Gaiman. OVERALL GRADE: B minus to B.
Half-way between a fairy Tale and Norse mythology. You can't help but love Odd, the unusual hero of the story and his even less usual methods. He is a child who has lost his father, whose mother has remarried and his stepfather is not the most welcoming one. One day something happens and unlucky Odd sort of runs away and bumps into a bear, an eagle and a Fox, and that's where the real adventure begins. It brought back memories of my childhood days lying on The carpet reading a fairy Tale about a Half-way between a fairy Tale and Norse mythology. You can't help but love Odd, the unusual hero of the story and his even less usual methods. He is a child who has lost his father, whose mother has remarried and his stepfather is not the most welcoming one. One day something happens and unlucky Odd sort of runs away and bumps into a bear, an eagle and a Fox, and that's where the real adventure begins. 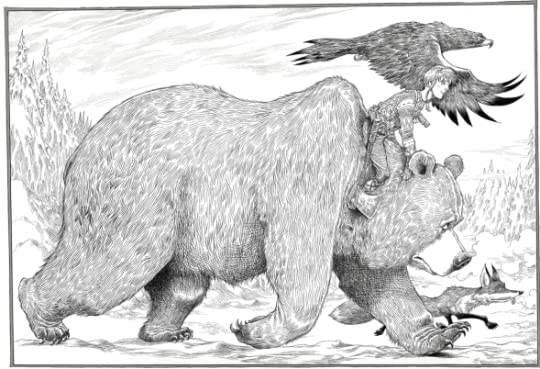 This is Neil Gaiman's take on Scandinavian mythology for a younger audience. But there are so many things in it that make it more than a modernized version of a myth. We get Norse society from the point of view of a young boy. We get allusions to Viking raids, the haunting sadness of Odd's mother, and the unpleasantness of life with an unwelcoming stepfather. Life, despite its fleeting beauties and touches of humour, can be "nasty, brutish and short." 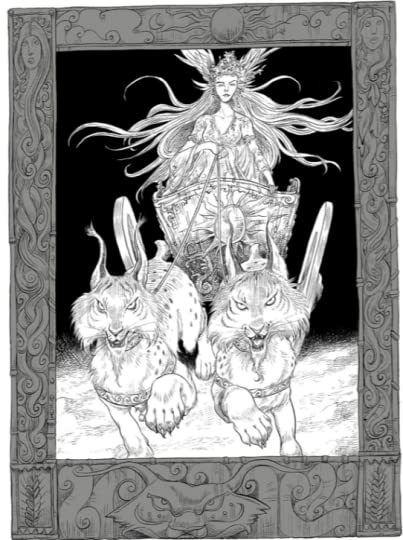 Odd, like many of Gaiman's heroes, is an odd This is Neil Gaiman's take on Scandinavian mythology for a younger audience. But there are so many things in it that make it more than a modernized version of a myth. We get Norse society from the point of view of a young boy. We get allusions to Viking raids, the haunting sadness of Odd's mother, and the unpleasantness of life with an unwelcoming stepfather. Life, despite its fleeting beauties and touches of humour, can be "nasty, brutish and short."